The fifteenth anniversary of the euro in 2017 offers a good occasion to reexamine what is wrong with the present international monetary arrangements and the theories used to justify them. Theoretical questions concerning the nature of money have profound implications for policy issues, including the mandates of central banks, interest rates, exchange rates, credit growth, and trade policy. The present, flawed perceptions about money have provoked crises and continue to prevent the expansion of commerce. This article presents an alternative framework for managing monetary affairs, actually going back to a variation on the Bretton Woods system of stable exchange rates, and adding enforcement provisions. Any such agreement would be part of a multilateral commitment to restructure and expand trade both within and between countries. Exchange rate stability would significantly lower the costs of entering into contractual agreements, thereby facilitating economic expansion and minimizing negative distortions. Restoring exchange rate stability is a necessary step toward limiting financial and political upheavals. I also argue that, in its present shape, the euro is doomed, and that exchange rate instability is the elephant in the room in discussions about “free trade,” in part because the present regime of floating exchange rates has long been distorting capital flows. Others argue for quantitative monetary approaches, even though Milton Friedman acknowledged in a June 2003 Financial Times interview that rigidly targeting the quantity of money was a mistake, too. In a 1999 New York Times interview, entitled “My Biggest Mistake,” he also acknowledged his bad judgment in believing that “putting my ideas in Keynesian language . . . would make any dent on the Keynesians.”2 He weakened his analyses and led himself astray by having done so, Friedman added. Nevertheless, present debates about monetary and fiscal policies still use the same jargon. Some believe in targeting inflation rates, even if the indices are gravely mismeasured at critical times.3 Still others believe in floating exchange rates, and some embrace optimum currency areas, even though they acknowledge that Europe lacks many of the institutions necessary for it to be defined as such an area. None of these views prevented—and some contributed to—major financial and political crises. Since the 2008 crisis, central banks have claimed, among other things, to pursue policies designed to induce more risk-taking. The poor results of these policies speak for themselves.4 Surprisingly, few raise the question: on what basis do the Federal Reserve and the European Central Bank (ECB) believe that they possess the ability to conduct monetary policy so as to induce people and funds to take more risks, when they did not manage to fulfill even simpler mandates? Recently, Lawrence Summers suggested a drastic change in central banks’ mandates: have them become an agency of the Treasury to centralize more power over money and credit. He speculates that the new agency’s bureaucracy would be able to better manage the yield curve and to more easily coordinate government spending. But is even more centralization of power, in itself, the solution to our monetary disorder? The expanded powers of government have already diminished the accountability of the various agencies. Moreover, as incomes are more highly taxed and governments borrow more, “money” gradually loses meaning as a medium of exchange, as a store of value, or as a unit of account. It could, however, continue to be used for accounting purposes, as was the case in the formerly Communist countries, where central authorities determined the prices of items, even though many items were not available. But this is not quite what people mean by pursuing “monetary policy.” The changing meaning is part of the problem: we refer to the Soviet ruble, floating dollars, or dollars anchored to gold all as “money,” but the three do not have much in common. In order to prevent future crises, the pressing need is to focus on restoring and then sustaining the most crucial role of “money,” namely, that of serving as a monetary yardstick. At present, the world does not have firm agreements in place that suitably maintain such a yardstick. Nor do we have any mechanism for credibly restoring a monetary yardstick when a crisis requires alterations to it. The following examination of events shows why this is the key, not just for global “financial stability,” but for political stability, too. Back to Basics: What Is “Money”? To illustrate the key role of monetary yardsticks, let us begin with events in a small and relatively isolated society. This is the story of the famous stone money of the Yap on a small island in Micronesia. It is discussed in Milton Friedman’s Money Mischief (Harcourt Brace Jovanovich, 1992), among other places. At the end of the nineteenth century, this small tribe used stone wheels as both a monetary yardstick for prices and as collateral for internal commerce. In order to function as a monetary yardstick, the stones had to be in limited and relatively fixed supply. The stones were no simple rocks found on the island’s natural landscape. The Yap brought these large limestones to their island from distant islands and carved them into disks, thereby ensuring that the number of such disks was limited. The German authorities then taxed the tribe, painting black crosses on these stone wheels, which indicated their confiscation. The tribe could no longer use them either to pay taxes or as collateral when trading among the tribe’s members. This impoverishment induced the locals to work harder and to build the roads—“infrastructure”—that the Germans wanted. In exchange, the German authorities compensated them by erasing the black crosses and giving back the rights to the stones. The erasure of the crosses turned the stones back into “currency” and restored collateral. Friedman concludes that this sequence of events shows how important illusion—myth—can become in monetary matters. He was mistaken. These events have nothing to do with myths and illusions. They show, rather, that the tribe understood money far better than today’s economists and central bankers. The loss and the destabilization of the customary monetary yardstick made the tribe poorer, threatened to unravel traditions and customs that enforced oral contracts, and also brought about chaotic pricing behavior until the yardstick was restored. The Yap worked harder for a while to restore their traditional yardstick and the value of collateral upon which their exchanges were built. In this case, the Yap reacted peacefully. In many societies, drastic devaluations, inflation, and confiscations have brought about significant political upheavals and violence rather than a placid willingness to build roads. Let us jump from the Yap to another widely told story from the history of monetary affairs, in order to illustrate the importance of yardsticks. Once societies stumbled on the relative scarcity of gold and silver, like the Yap’s stones, goldsmiths realized that they could lend some of the gold left on deposit with them to borrowers who paid interest for the loans. The goldsmiths, who both owned gold and protected others’ gold for safekeeping, quickly learned that they could lend a portion of the deposits without facing the risk of immediate withdrawal upon the owners’ demand. As evidence of the deposits, the goldsmith issued receipts. (The British currency is still called pound “sterling”; when that term was introduced it referred to the certificate backed by a pound of silver.) Gradually, as the goldsmiths established their credibility, they no longer had to give borrowers gold to buy commodities and services. Rather, they issued their paper certificates for circulation, backed by the gold in their inventory and the quality of the loans they made—thus they became, in effect, miniature central banks. This is how “credit” expanded: a relatively small amount of physical gold, combined with the spreading use of double-entry accounting, supported a larger and larger mass of certificates.8 As commercial activities spread and the magnitude of loans overshadowed the value of any precious metals held in goldsmiths’ inventories, the reputation and selection of good credits sustained the value of the receipts. However, when too many bad loans, wars, or natural disasters prevented borrowers from repaying loans, people holding deposits could not be fully reimbursed, and goldsmiths (banks) went bankrupt. Notice that I have not yet mentioned the term “money,” referring specifically to a standardized unit that we encounter today. In the example above, banks each had their own currencies, but incentives for finding a standard “unit of account” became obvious. Say there are 1,000 rights to goods and services to be transferred now and in the future. In the absence of a monetary yardstick, there would be 499,500 possible prices, as each commodity, service or right would be priced in relation to every other. With one common yardstick, there would be only 999 prices. This numerical illustration shows why, since time immemorial, every society promptly invented an item to serve as a monetary yardstick. In prisons, these were cigarettes. In that prison land once known as the Soviet Union, cigarettes and Levi’s jeans were the yardsticks when rubles meant little except doing accounting. The next case, another rare, “almost” laboratory experiment, shows how cigarettes as yardsticks actually worked. Richard Radford was a British soldier, captured in 1942, who spent the remaining war years in prisoner of war camps. In 1945, he described with precision how life was organized in the camps. Radford reported that the relative values of all commodities and services were quickly expressed not in terms of one another, but in terms of cigarettes. The prices formed within a month of the creation of the camp. Exchanges rapidly emerged, establishing one price for each commodity. What the Yap tribe’s stones and the cigarettes in the POW camps had in common is that they were in relatively fixed supply, and as such these items functioned with reasonable utility as a yardstick. Until June 1944, according to Radford, prices in the camps were stable. They were stable enough that expectations of random, short term declines in the supply of cigarettes led to the creation of a “Shop” (the goldsmith’s equivalent) that issued paper certificates worth “one cigarette” which were accepted at par instead of a real cigarette. When the supplies of both cigarettes and parcels of food were unexpectedly halved in August 1944, the prisoners quickly got rid of the paper money, and cigarettes became the sole yardstick and medium of exchange. The paper money could still be exchanged, but only for types of food that prisoners did not want and whose inventories accumulated in “the Shop”—a familiar pattern to anyone who has lived under Communism—paper money thus becoming fiction. The Shop gave pricing guidance for “popular” goods, which it did not have in its inventory, and suggested that they should not deviate by more than 5 percent from the traditional prices when supplies were reliable. This appeal to “morality” had no impact, however. Black market sales quickly took place at “unauthorized” higher prices for items in demand, while the prices of unpopular ones dropped. Simplistic “quantity of money” theories would have predicted the following result: with supply of cigarettes halved, and the number of food items, too, the measured “price” level (if velocity remained roughly stable) should have remained roughly stable as well. But this is not what happened. Instead, the paper money instantly lost all its value in the camp. It was not accepted for anything, became a subject of jokes, and disappeared from circulation. Such events take place when wealth is suddenly diminished, destroying confidence in central authorities and banks. As with the Yap, when the yardstick was eventually destroyed, there was chaos: institutions needed to sustain the yardstick and carry-out trade collapsed. And although the prisoners went back to bartering, commerce was drastically reduced. Prisoners reverted for a short while to physical cigarettes, whereas in similar non-laboratory experiments, people reverted to gold, foreign currencies, and barter. When cigarettes ceased to be a yardstick, the Shop and exchanges—institutions that were based upon the cigarette yardsticks and sustained the value of collateral in the camp—disappeared. The organized economy of the camp dissolved into obscure pricing chaos through bartering, with all prices depending on the bilateral, momentary negotiating powers of the parties. When the camp lapsed into this chaos, various behavioral patterns emerged that will appear uncomfortably familiar today. As the “good food” disappeared from the Shop’s inventory it was no longer priced on the exchange but bartered in “black markets.” In response, the medical officer wanted to impose rationing and price controls, arguing that health issues would multiply. Since the total amount of food and of cigarettes was halved, however, it is not clear what exactly the officer expected that rationing and price controls would achieve. Rationing does not create supplies. Perhaps it could have had short-term, redistributive effects—if enforced. It is impossible to know, because the prisoners did not listen to the medical officer anyway. “Class warfare” erupted, too. Simultaneously with the medical officer’s regulatory ideas, “activist” prisoners advanced other theories. They blamed “middlemen” (called “speculators” today) for the deflation, the “black markets,” the chaos in the camp, and so on. They developed versions of medieval ideas of “just prices,” which referred to the prices before the supply of food and cigarettes was curtailed. Yet these “theories of ethics” had no impact on either prices or prisoners’ behavior. Nothing but barter ensued until the camp was liberated by the Thirtieth U.S. Infantry Division on April 12, 1945. Let us turn now to historical examples of these principles when applied to national economies with longer horizons. Following World War I, Europe and the United States committed one blunder after another in matters of domestic and international debts as well as monetary policy. After World War I, Churchill should have properly re-anchored the pound sterling at the new price level rather than attempting to travel back in time to a situation that was long gone with the winds of war.9 If he had done that, England might have set an example, renegotiated the continental debts, and—who knows—history might have taken very different turns. The same holds true about the Roosevelt administration’s inadvertent destruction of China’s silver standard. During the 1930s, China was on the silver standard. This meant that the U.S. price of silver determined the Chinese yuan-to-dollar exchange rate. Thus China remained relatively insulated from the impact of the first years of the Great Depression.10 In 1933, however, responding to the politically strong (though small) silver lobby, the U.S. government passed a series of acts and amendments that had the effect of increasing silver prices by roughly 128 percent by 1935, bringing about a drastic appreciation of the yuan relative to the dollar. The Chinese conveyed to the Roosevelt administration that they believed that the United States “has no intention . . . of trying to mess up [China], but nevertheless it is messing us up terribly.”11 China’s domestic output and prices fell drastically, and in 1934 China effectively abandoned the silver standard. There was monetary chaos, and historians continue to argue over the extent to which these events contributed to the fall of Chiang Kai-shek and the rise of the Communist Party to power. If they did, it would not be surprising, as by the mid-1930s there were no models of society that appeared worth emulating.12 This episode is a reminder that monetary chaos can contribute to political instability and has long-term, devastating consequences. A reverse sequence of events took place in post–World War II Germany between 1945 and 1948. An estimated 20 percent of all housing in Germany was destroyed during World War II. Food production per capita in 1947 was roughly half of what it had been in 1938. Industrial output in 1947 was one-third its 1938 level and a large percentage of Germany’s working-age men had died. The numbers reflect drastic impoverishment. The Reichsmark had no value. In fact, it stopped circulating, much as had happened to paper money, once reliably backed by cigarettes, in the POW camp. Instead, as in the camp, cigarettes and soluble coffee became the currencies of the day, and ration cards were exchanged for basic items. People also resorted to barter. City dwellers regularly traveled to the countryside to exchange lamps, curtains, and books for food and coal. The government directed most of the money flows because no intermediary institutions could function properly, with the Reichsmark playing the same accounting role as the ruble did in Communist Russia, having no “real-life” meaning. Order was restored only when Ludwig Erhard introduced the Deutschmark, stabilized the currency, abolished price controls, and lowered taxes drastically (before these reforms, the highest marginal tax rate was 95 percent). This 1948 stabilization, with its elimination of price controls and drastic reduction in tax rates, fostered the “German miracle” (which was also supported, until 1961, by twelve million mostly well-trained yet penniless immigrants who were escaping Communism in Eastern Europe). Unstable units of account prevent exchanges of goods and services from taking place. The existence of “banks” (the combination of the Shop and the Exchange in the above examples) are based upon expectations of stable units of account. Sudden impoverishment, when perceived to be permanent, brings both the destruction of the unit of account and the institutions that kept it stable, as seen in the closed POW society or the UK and China pre–World War II examples. In a society with longer horizons, like post–World War II Germany, a stable yardstick had to be restored before economic institutions could flourish again. The previous illustrative examples showed the importance of sustaining units of account. The events examined next, the case of the Bretton Woods system, illustrate the ways in which units of accounts can be restored, and what happens if this is not executed properly. However, by 1964, foreign official dollar holdings came to exceed the value of the U.S. gold stock. If confidence in American policies was maintained, that in itself would not have been a problem. However, by that year, the United States imposed various restrictions to diminish the outflow of capital—tying foreign aid to U.S. exports, defense purchases, or support for U.S. troops abroad, while asking banks to curtail overseas lending, and restricting overseas investments of American corporations. These developments were intensified by the Vietnam War, beginning in 1965. This conclusion was not accurate then, and it is not now. As long as investors expected the United States to continue to grow, expanding its tax base—and other countries around the world to adhere to the Bretton Woods agreement—the United States could have sustained the system by persuading the other countries party to the agreement to enforce the penalty imposed on states accumulating reserves. This, as noted earlier, was supposed to be part of the system. Or, if some countries were unwilling to accept this, perhaps because of a genuine need to correct the value of their own currencies, then allow the other Bretton Woods option: a one-time devaluation under the “fundamental disequilibrium clause.” Even the United States could have resorted to this clause and sustained a new yardstick. It need only have explained that the devaluation was an emergency, one-time affair, but that its commitment to stable exchange rates under the Bretton Woods system would remain. By then, however, many cracks in the system were spreading. In 1964, Britain elected a government committed to variations of “five-year plans” (a policy borrowed from communist countries), nationalization (steel), increases in top income (raised to 83 percent) and capital gains tax rates, and price and wage controls. Not surprisingly, such a centralization of spending power and economic control also led to expectations that Britain would devalue the pound. It did so in November 1967. France’s Charles de Gaulle attacked Bretton Woods directly, arguing against the exorbitant privilege it granted to the United States by allowing its balance of payment deficits to be settled in dollars. Instead of advocating for the enforcement of the provisions in the Bretton Woods accord—penalizing countries accumulating reserves, or advocating for the expansion of imports in creditor countries rather than centralization in debtor countries—he advocated a return to the classical gold standard. De Gaulle perceived the main problem to be that the debtor country, the United States, was not fulfilling its role. But he failed to take note of the obligations of the countries accumulating reserves and the long-forgotten penalty clause. Still, until 1973, the United States and its trading partners tried to shape variations on the fixed exchange system. In 1971, the Smithsonian Agreement established an international system of fixed exchange rates, but without the backing of silver or gold, and allowed for an 8% devaluation of the U.S. dollar, raising the price of gold from the arbitrary $35 to the equally arbitrary $38. Though then–U.S. president Richard Nixon praised the agreement as “the most significant monetary agreement in world history,” it was not. There were no discussions about the fundamentals of sustaining stable exchange rates, just haggling about margins for exchange rate fluctuations and the immediate numerical range of devaluation and appreciation. Britain floated the pound in June 1972; for different reasons, the Swiss floated the franc in 1973, and the United States advocated for a new round of negotiations for further exchange rate realignments. In March 1973, the G-10 approved for six members of the European Community to tie their currencies together and float them all against the U.S. dollar, finally bringing an end to the fixed-exchange system. The answer to the last question is positive. The poorly thought through shift to floating currencies undermined the stability of the unit of account. By failing to stick to principles that make commercial societies thrive, the United States threw out the baby with the bathwater. Undermining the stability of the unit of account has raised the costs of entering into contractual agreements, the basis of economic activity. At the same time, the floating-rate system, as it is practiced, has done little to correct the global trade imbalances that led to the unraveling of the Bretton Woods system. Furthermore, the floating system does not allow for a better matching of capital with talents and opportunity, but merely inflates the financial sector. The U.S. dollar and the euro have fluctuated 50 percent against each other since 2002 when the euro replaced twelve national currencies. The fluctuations occurred despite the fact that inflation rates in the U.S. and the eurozone were measured to be within similar ranges. This, of course, contradicts the predictions of floating exchange rate models that assert that such volatility is not supposed to happen when inflation rates are so proximate. These volatile currencies are now accompanied by a wide range of futures and derivatives, which are all in fact “money.”21 These standardized contracts are temporary stores of value in the chosen units of account, all hundreds of trillions of them (in notional value). The contracts mitigate the impact of currency volatility in companies’ contractual agreements. They allow Apple, McDonald’s, Coca-Cola and other global companies to carry out their businesses without inadvertently being drawn into the exchange rate business—obviously at a cost, as Wall Street services do not come cheap. This significant expansion of the financial sector is partly due to the shift to floating currencies. It is a response to central banks’ and governments’ failure to grasp the crucial role of units of account and the importance of repricing them properly after crises. The financial, accounting, and legal sectors would be significantly reduced if countries agreed to stabilize exchange rates. Most of these hundreds of trillions of derivative contracts would disappear. The mathematical and financial talents now used in financial modeling and trading would be fruitfully employed elsewhere. More importantly, the costs of both domestic and foreign contractual agreements would be significantly lower, bringing about the expansion of commerce both domestically and around the world and, indirectly, mitigating disputes about trade. The latter disputes occur, in part, because the floating system imposes disproportionate burdens on developing countries, prevents the deepening of their capital markets, and increases the cost of raising funds for companies in those countries. These countries’ governments then increasingly play the role of providers of capital—a distant second best and a role that makes it complicated to assess whether a trade is subsidized or not. Yet there is no doubt that governments and central banks have the ability to stabilize currencies during normal times. After all, there are many “moneys” in circulation. For instance, we have $100, $10, and $5 bills. We also have quarters, dimes, and pennies, as well as an array of foreign currencies circulating. They all function as a medium of exchange here and around the world, exchanged for different ranges of goods and services. The U.S. denominations stay in fixed relation to one another, as do the denominations of other currencies. Ask then: why can the $10 bill always be exchanged for forty quarters, whereas the number of foreign currency units it can be exchanged for varies daily? After all, the demand for the $10 bills and quarters fluctuates. With fewer parking meters, more automatic machines accepting credit cards and cell phones, the demand for quarters has been dropping, and the demand for paper bills changing. Why doesn’t the value of the quarters drop relative to the $10 bill? The answer is that as fewer coins are being used, they get returned to the central bank, which then issues $10 dollar bills instead. This same process can work for any two currencies of different countries. If people decide that they intend to spend less in the United States, they can go to a bank and ask to exchange their unwanted U.S. dollars for, say, Canadian ones. The Federal Reserve would notice that the demand for U.S. dollars decreased, so it would absorb the unwanted U.S. dollars by selling U.S.-denominated bonds on the open market.22 The exchange rate between two countries can stay stable just as the “exchange rate” between the two U.S. denominations stays stable. If, for example, taxes are lowered, having the impact of expanding commerce and increasing the demand for a particular currency, the central bank could respond to the signals emanating from the chosen unit of account, around which exchange rates are stabilized. On the contrary, if a country’s tax base is weakened, whether because of wars or overly generous spending on entitlement commitments, monetary authorities could either sustain stable exchange rates by absorbing the unwanted liquidity through selling bonds, while restructuring, or they could be allowed to devalue in extreme circumstances. At the same time, countries accumulating excessive reserves would face penalties, rather than playing blame games and accusing the debtor countries issuing the reserve currency of not saving enough. Why, then, would an agreement stabilizing exchange rates be accepted by countries in the real world, rather than merely in theory? Let us turn to a few examples. There is a far better alternative. After all, Chinese people would like to buy products and services from the United States, travel to its shores as tourists, and acquire businesses and real estate. By incentivizing expanding commerce and consumption domestically, Chinese compensation in U.S. dollar terms would rise, and this would achieve the goals of both maintaining exchange rate stability and gradually solving balance of payment problems, whereas an appreciating yuan is unlikely to.25 After all, expecting currency appreciation, Chinese employers are less likely to offer higher compensation, since they would expect to export less. By contrast, increasing incomes in China in dollar terms would attain that objective and many others too.26 In order to bring about such higher incomes, a properly negotiated, stabilized yuan/dollar rate—under a renewed Bretton Woods–type agreement, must be part of the solution to the international trade issues that are now at the top of the new administration’s agenda. Although the yuan may be informally pegged, that is not the same thing as a formal agreement with clauses imposing changes in policy to prevent further accumulation of reserves, and allowing for the occasional identification of “fundamental disequilibrium.” As shown before, such an agreement would require a commitment to expanding commerce within China; and, if China accumulates “undue” reserves, China should be penalized, in accordance with the clauses of the Bretton Woods agreements. How such penalties would be enforced remains to be negotiated, but it would be part of the overall international monetary framework to stabilize exchange rates. Rather than rely on simplistic, symbolic measures such as labeling China a “currency manipulator,” the Trump administration should use the present moment to achieve currency stabilization that, over time, would have more significant benefits for the U.S. economy. Under the present system, any increase in U.S. economic activity causes a rising dollar that undermines exports. The only sustainable source of economic growth in the reserve currency country under the present (quasi-)floating system is rising U.S. consumption funded by debt. While the creditor countries, accumulating reserves, have no obligations in the present system, it is the debtor country—the United States—that is being asked to make domestic adjustments. Stabilized exchange rates, accompanied by the institutional changes described above, are the key to restoring future domestic and international growth for the United States. Rather than undermining U.S. exports, a new Bretton Woods system, fully enforced, would allow for expanding U.S. manufacturing and other export industries. Although China is highlighted here as an example, any such new Bretton Woods agreement would have to include Japan and the other major world economies as well. While on the surface it might seem that the euro solved the problem of creating a stable unit of account by replacing a number of volatile national currencies, at closer inspection that does not appear to be the case. From its inception, the euro was anchored in a monetarily disciplined Germany, but it was always acknowledged that more European institutions would be needed to establish the currency’s long-term credibility. It was especially necessary to keep those members of the EU with a weak tax base in check in terms of their government spending and borrowing, while balancing exporters—creating a kind of European mini–Bretton Woods system. This was never done, though since the 2008 crisis, this is what the European Central Bank (ECB) and the IMF have tried to do in many awkward ways. They have basically tried to “penalize” the countries that have been accumulating reserves by forcing them to give aid to debtors (explicitly and implicitly through the ECB) while cajoling the misbehaving PIIGS (Portugal, Italy, Ireland, Greece, Spain) to change their domestic policies and reduce extravagant entitlements. Although some advocate that Germany should now accept the mutualization of EU members’ debts,28 I do not perceive that there is any chance that Germany would agree to mutualization as a solution—and it should not. The better solution would be to adopt the second neglected clause in the Bretton Woods agreement, and allow for the misbehaving countries to exit, devalue once, and, after years of displaying disciplined behavior, perhaps be readmitted. The problem with the euro as a unit of account today is a variation of the problem Churchill faced with the pound after World War I. During that time, the war led to the centralization of spending and accumulation of debts—and high inflation and devaluation during the war. In spite of these facts, Churchill thought that the pound could be relinked and sustained at the prewar gold price—a big mistake. Today, many European countries face similar circumstances—these countries have increased economic centralization, maintained large entitlement spending commitments, and accumulated public debt, while many have aging and shrinking populations. These countries have significantly less collateral than when the currency level was set (a result similar to, even if not arising from, the impacts of wars). Thus Europe is currently attempting to sustain a unit of account for some of its member countries that no longer reflects reality, repeating Churchill’s mistake. Perhaps if the European Community had an internal, proper Bretton Woods–type agreement, they could have prevented the present crisis. But they never did, and today the option of adjusting their unit of account in unusual circumstances via a one-time devaluation—an option granted, though not enforced, in the Bretton Wood agreement—does not exist. In the absence of clarity, created by confused government policies and the current exchange rate system, what are in fact monetary crises are now experienced as debt crises, bringing political upheavals. Although Mr. Paulson is mistaken in not advocating for a more credible international debt-enforcement regime, he has a point about not defending “vulture funds.” That said, he should have been more precise with his wording; Mr. Paulson should have forthrightly stated his apparent preference to assist poor countries with aid. Yet, in Europe, even this would likely have been insufficient without a proper exchange rate regime. During his farewell tour in Europe, Mr. Obama was mistakenly optimistic when he stated, “I will continue to urge Greek creditors to take the steps needed to ensure the country is well placed to return to robust economic growth, including by providing meaningful debt relief.”31 At €330 billion, Greece’s debt is 180 percent of measured domestic product. Yet this is only the beginning of Greece’s problems. I doubt Mr. Obama took as much as a glance at Greece’s rapidly disappearing population. By 2030, one third of its population will be above sixty years old, and the Greek population will be in overall decline. The percentage of Greeks over sixty will rise to 41 percent of the population by 2050. So who, exactly, does Mr. Obama believe will bring about the Greek recovery?32 Creditors can negotiate their investments, but why would European taxpayers assume more burdens when Greece’s tax base and resulting collateral will continue to face significant pressures? If Europe, foreign investors, and the IMF all decide to forgive Greek debts, they can do so. However, they should not expect that this alone will result in a sustainable recovery. Rapid demographic decline aggravated by a bad monetary system prevents that. The debt crisis is a symptom and not the source of the problems. Yet this debt situation could have been avoided if the European Community had adopted a kind of internal variation of the Bretton Woods agreement, allowing Greece to exit and devalue. Later, if Greece had been able to adjust its institutions, it could have been accepted back into the euro. Today, mobility among the EU’s “strangers” takes the shape of moving “under” and “sideways”: shifting economic activity to large black markets where incomes are untaxed, while “mobile wealth” flees the country (through emigration of the younger and more entrepreneurial). Not much remains of the tax base to collateralize the country’s bonds. Neither can they sustain a monetary yardstick. Fixed exchange rates cannot solve “fundamental disequilibrium”—to use one of the escape clauses that the Bretton Woods system defined to allow for occasional devaluation. The source of the euro crisis this time was not wars, but a significantly weakened tax base, associated with unanticipated demographic changes and with the compounding of debts, exaggerated entitlements, and undisciplined government policies.34 The poorly thought-through adoption of a common currency failed to consider these problems and, now, only exacerbates them. The solution for the United States, for Europe, and for many other countries, including China, would be to negotiate a credible variation of the Bretton Woods agreement and stabilize exchange rates. Such an agreement would allow for rare, occasional devaluations when some countries’ collaterals are drastically impaired. At the same time, it would also enforce penalties on countries accumulating reserves. This system, though, makes sense only if it is viewed as part of a long-term expansion of commerce around the globe, and it is a system that would contribute to sustaining such a goal. Countries insistent upon centralization of economic activity could not be part of such an agreement.35 Meanwhile, countries insistent upon accumulating reserves would be penalized. If such agreements are not adopted, expect further monetary and debt crises, slowed economic expansion, and more political upheavals. This article originally appeared in American Affairs Volume I, Number 2 (Summer 2017): 84–106. The author thanks Stephen W. Shipman both for his comments and editing. 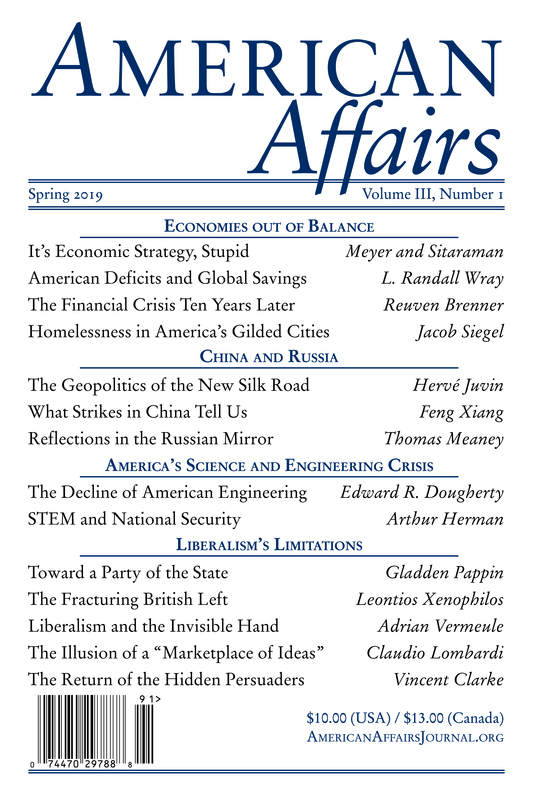 1 See Reuven Brenner, “Dismiss Macroeconomic Myths, and Restore Accountability,” American Affairs 1, no. 1 (Spring 2017): 62–81. 2 Milton Friedman, “My Biggest Mistake,” interview by Michael M. Weinstein, New York Times, July 4, 1999. 4 See Reuven Brenner and Martin Fridson, “Treasury’s Little Buddy,” International Economy (Fall 2013): 28–33. In 2008, European and American shell-shocked, aging baby boomers lost significant portions of their wealth. Those aged over 55—the savers—were understandably not in the mood to take more risks, no matter what central bankers were doing. Instead, they predictably went into insurance mode. Low interest rates are not an inducement for this age group to take more risks. On the contrary, losing significant portions of their wealth increased their difficulty in finding decently paying jobs, and expectations of diminished pensions and higher health costs led them to deploy their diminished savings in capital preservation modes. 7 Monetarists’ disbelief in the finding came from their view that inflation is a monetary phenomenon, whereas “unemployment” is a real one, and so unless people made the same mistakes repeatedly, there could be no such stable relationship. If governments pursued policies leading to higher inflation unexpectedly, this school of thought admitted that there could be a relationship, but an unstable one and of short duration. But economists did not take into account the use of unexpected, higher inflation for fiscal purposes and the resulting impoverishment. 9 See discussion in Brenner, “Dismiss Macroeconomic Myths.” Churchill acknowledged that mispricing the sterling after World War I was his biggest blunder ever. 10 See Milton Friedman, “Franklin D. Roosevelt, Silver, and China,” Journal of Political Economy 100, no. 1 (Feb. 1992): 62–83, and Arthur Nichols Young, China’s Nation-Building Effort, 1927–1937 (Stanford: Hoover Institution Press, 1971). 11 See Young, China’s Nation-Building Effort, 207. 12 See Reuven Brenner, The Force of Finance: Triumph of the Capital Markets (London: Texere, 2001), chap. 1. With hyperinflation in many European countries and high unemployment in both Britain and the United States, none of these countries’ models of society appeared worth emulating. 13 The reason for countries to pursue policies of undervaluing their currencies and giving their exporters an advantage is political: exporters depend far more on their political masters than importers. Centralized countries, with no domestic competitive capital markets that would disperse power (an impact which is enough reason for politicians whose power depends on controlling capital flows to oppose it), can still export successfully. But sooner or later such moves toward centralization in major countries destabilize a system of stable exchange rates. 14 Occasional devaluations were permitted. Though just how much flexibility there should be in exchange rates was never defined operationally. The IMF accepted the jargon of rationalizing devaluation when there is “fundamental equilibrium.” But as Per Jacobsson, the IMF managing director in the 1960s, stated (when such statements were still acceptable and no reason for instant firing), “You can no more define equilibrium in international trade than you can define a pretty girl, but you can recognize one when you see one.” See Lawrence Malkin, “Britain Took Devaluation with Ease,” Associated Press, November 19, 1968. 15 See Paul A. Volcker and Toyoo Gyohten, Changing Fortunes: The World’s Money and the Threat to American Leadership (New York: Times Books, 1992), 20–25. 16 This argument continues to be repeated, including in: Alan Blinder, “Five Big Truths about Trade,” Wall Street Journal, April 22, 2016. 17 The view was popular among all those identified with the so-called monetary approach to the balance of payment, including many in the economics department at University of Chicago, such as Harry Johnson. Contracts play no role in these models. 18 Robert Mundell, also at the time at the University of Chicago, and believer in “optimum currency areas,” predicted the harmful consequences of floating, left the department, and his views remained marginal for a while. 19 See Volcker and Gyohten, Changing Fortunes, 100–2, and the preface. 20 Some locking in is justified when, for example, a previously centralized country (say, under Communism) wants to decentralize. The country needs, then, a solid anchor for adjusting, and does not have a deep financial market to hedge, which would be necessary if it floated its currency. 21 See Lester G. Telser, “Futures and Actual Markets: How They Are Related,” Journal of Business 59, no. 2 (Apr. 1986): S12. 22 This action may briefly increase interest rates, though not necessarily. If investors did not expect such policy, they would have expected higher inflation rate, which would have been reflected in higher nominal rates. The firm commitment to stable exchange rates, and anticipating such “automatic” reaction by central banks, would keep interest rates stable. 23 What would prevent countries from serially overspending, and requesting recognition of “fundamental disequilibrium” often—is that then they would be no longer part of the new Bretton Woods–type agreement, would have a floating currency, and bear the consequences of the significant costs on the slowed flow and higher cost of capital, impoverishing the country. 24 Recall too the case of Argentina’s currency board, which linked its currency firmly to the dollar, only see the latter appreciate significantly, while all its trading partners were seeing their currencies devalued. Argentina did not have the credibility to argue that if they carried out a devaluation it would be due to a “fundamental disequilibrium,” and not that it is reverting to its past irresponsible monetary practices. 25 It is true, there are no free lunches in this world—and power would get more dispersed within China. 26 For example, enforcement of intellectual property rights: only when societies get richer do they begin to enforce patents. Remember the times when Israel was called the “one-diskette” country? History is now repeating: many European countries (Switzerland and Belgium, for example) introduced and enforced patent laws only after they already some industries to their shores—because they did not previously have such laws on their books. Switzerland, for example, did not have a patent law until 1887. The 1887 Swiss law covered only inventions that could be represented by a model, leaving all other processes unprotected. This was the main reason for the success of its chemical and aluminum industries, since the French and German companies who innovated, but whose production methods were considered too close to existing ones in their home countries, moved to Switzerland. 27 With a floating currency system, its role in effect expired. But trust bureaucracies to invent rationalization to perpetuate themselves. 28 See Ad van Riet, “Safeguarding the Euro as a Currency beyond the State,” European Central Bank Occasional Paper No. 173, May 2016. 29 Even the ability to seize sovereign assets as collateral is procedurally complex, cost-intensive and time-consuming. It is highly unlikely that any authority has the ability or willingness to “send in the Marines,” blockade the defaulting countries, or send in financiers to overhaul their treasury departments, which, until some ninety years ago, was an accepted international “bankruptcy regime,” though one destined to provoke greater political crises. 30 See The State of the International Financial System, Hearing before the Committee on Financial Services, U.S. House of Representatives, 110 Cong. 39–40 (June 20, 2007) (statement of Henry Paulson), and Faisal Z. Ahmed, Laura Alfaro, and Noel Maurer, “Lawsuits and the Empire: On the Enforcement of Sovereign Debt in Latin America,” Law and Contemporary Problems 73 (Fall 2010): 38–46. Already existing “national democracies” that had currencies backed by a treasury with a weakened tax base, which could do occasional devaluation, do not prevent monetary and financial crises. A currency that is not backed by rules that would force countries sharing it into the disciplined behavior its existence was supposed to be backed by—rules similar to clauses in the Bretton Woods agreements—cannot last long. 31 Quoted in Helena Smith, “Barack Obama Calls for ‘Meaningful Debt Relief’ for Greece,” Guardian, November 13, 2016, https://www.theguardian.com/us-news/2016/nov/13/barack-obama-calls-for-meaningful-debt-relief-for-greece. 32 Not that I give full confidence in the official Greek numbers about their domestic product, since their informal markets (such as tourism and agriculture—on its hundreds of island in particular—are the main industries) have been estimated to be in the high teens. And with the stable family businesses on those islands, and the deep culture of tax evasion, I doubt much tax enforcement can be carried out. 33 Lenders can never reasonably expect people with poor prospects and no collateral to pay interest and repay the capital. Giving loans to poor people with no prospects lead to disputes, conflicts and court proceedings. These impose heavy burdens on societies, requiring that families, religious institutions, and governments step in to re-stabilize communities. Usury laws for members of the tribe prevented these destabilizing consequences in these sparsely populated agrarian societies. The Biblical conclusion was that unfortunate people and people falling on hard times should be given charities not loans. Mr. Paulson’s comments appear to reflect this thought, applied to countries. But the few biblical “strangers’” situation was different: when they borrowed money, they posted collateral that the locals could capture in case of default. 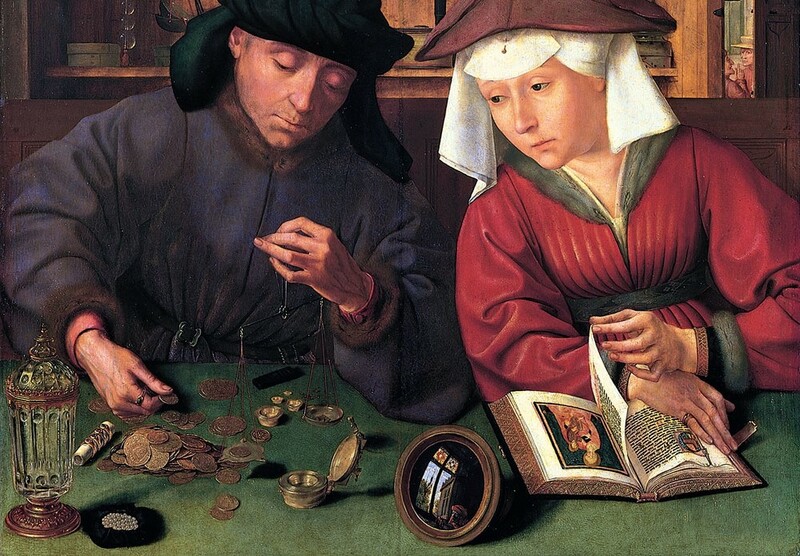 The “collateral” was not only any physical or monetary asset that the stranger/borrower could provide, but also, in case of default, the assets of any person belonging to this “stranger’s” fellow travelers. Rumors of default of one “stranger” induced his fellows to flee, preventing the local lenders from getting their collateral. This “mobility of the collateral” is why “strangers” had to pay higher interest than “immobile,” poor brothers. 34 Also: Europe’s aging population and diminished fertility rates imply a short horizon with “après moi, le déluge” philosophy—reminding one of the POW experiment in its final days. If the Spanish, Greek, and Italian tribes do not want to reproduce why would they have a long horizon—especially as they do not appear to be thrilled for Muslim crowds inheriting their Earth? The shorter horizons reduce the chances of finding the political will to make draconian changes in political institutions. Moreover, with the present pool of immigrants not appearing to desire and share local culture, and with Europe’s entrepreneurial youth moving to the United Kingdom, Canada, the United States, and Australia, the EU will see an increasingly weakened tax-base (unless, perhaps millions of Chinese with a pragmatic religion already separated from state, unlike Islam, flock to Europe). 35 If countries are bent on centralization, the entire analyses in this piece becomes moot, as prices are becoming a fiction, having no relationship to relative scarcities, and the currency is gradually reduced to being an accounting device—as currencies were, under communism. Reuven Brenner formerly held the Repap Chair at McGill University’s Desautels Faculty of Management. He is the author of several books including Force of Finance (Texere, 2002) and World of Chance (Cambridge University Press, 2008).